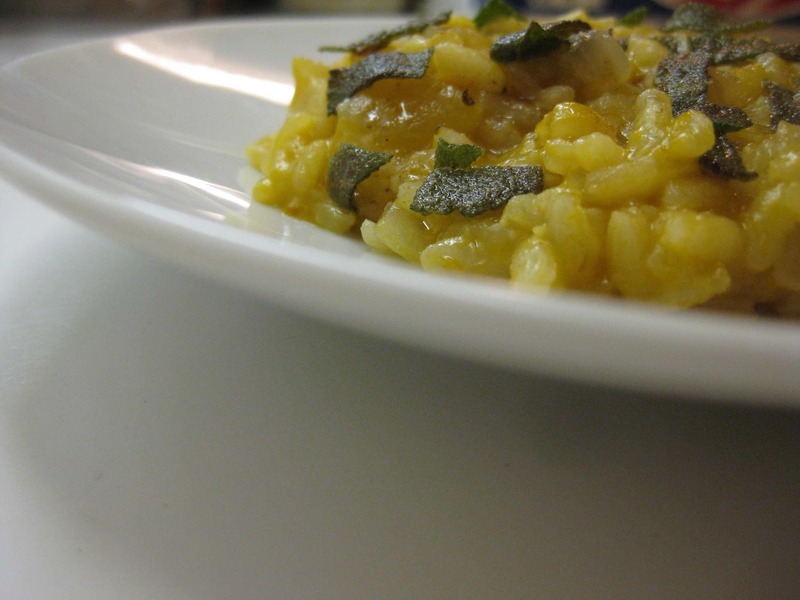 Risotto is one of the ultimate comfort foods in our house. A little leftover winter squash and turkey stock from the Thanksgiving bird were transformed into a delicious dish, satisfying enough to constitute an entire meal with just a salad of bitter greens and pears on the side. My typical proportions for risotto are ¼ cup of rice per person for a main dish, a little less for a side, cooked with 1-1¼ cup of stock. I end up using a little less stock when I’m adding something that contributes to the liquid content, like squash. So for this I used ¾ c Arborio rice, 3 cups of turkey (or chicken) stock and 3/4 c pureed squash. Needing something to spark up the dish, I made browned butter and sautéed a few sage leaves, which I stirred into the risotto and also sprinkled on top. This was an entirely local and organic meal with the exception of the rice. I used a hard local cheese instead of the usual Parmesan. Lightly sauté the onion in a little butter until soft. Add the rice and stir to coat the grains. Start adding the stock, about ¼ c at a time, regulating the heat to keep the liquid at a simmer. Keep stirring and adding additional ¼ c of stock. The entire risotto should take about 20 minutes to cook. About half way through, start adding the pureed squash with the stock. When the risotto is just finished, adjust the seasonings and add the grated cheese. Serve immediately. Optional garnishes: sage leaves browned in butter, parsley or other herbs, sautéed leaves of Brussels sprouts or other greens.